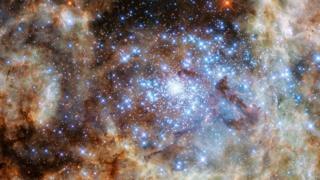 Hubble has probed a clutch of monster stars about 170,000 light-years away on the edge of our Milky Way Galaxy. Some two dozen behemoths were identified, all with masses in excess of a hundred times that of the Sun. Four were known previously, including the remarkable colossus catalogued as R136a1, which is 250 times as massive as our home star. But the new survey finds many more of the super-objects in a tight patch of sky within the Large Magellanic Cloud. "In just a tiny bit of this satellite galaxy, we see perhaps a couple of dozen stars with more than a 100 solar masses, of which nine are in a tight core just a few light-years across," explained Prof Paul Crowther from Sheffield University, UK. "But that two dozen number - that's probably more than are in the entire Milky Way Galaxy for this type of star," he told BBC News. The observations are to be published shortly in the Monthly Notices of the Royal Astronomical Society. They build on earlier work reported in 2010 that first described R136a1 - the most massive and most luminous star identified to date. That study used data gathered principally by a ground-based telescope in Chile. This follow-up research employed the pin-sharp resolution and ultraviolet sensitivity of the orbiting Hubble telescope to tease out yet more detail. In 2010, astronomers saw four monster stars including R136a1 in the central core. Thanks to Hubble, they detect a further five. The stars are not only extremely massive, but they are also extremely bright. Together, these nine stars outshine our Sun by a factor of 30 million, said Prof Crowther. "Because they are so massive, they are all close to their so-called Eddington limit, which is the maximum luminosity a star can have before it rips itself apart; and so they've got really powerful outflows. They are shedding mass at a fair rate of knots," the astronomer added - up to an Earth mass of gaseous material per month. The question is why this tight corner of space, located in the Tarantula Nebula of the LMC, harbours so many giants. Prof Crowther thinks it is because the gas and dust in the region has become compressed as the Large Magellanic Cloud has skirted the edge of the Milky Way. One thing is for sure - none of these monster stars will be around for more than a few million years. To burn so bright is to burn briefly. "A lot of these stars will be in binaries (in pairs), and when they die they'll produce black holes, which will merge at some point in the dim and distant future. And when they do they'll produce gravitational waves. "The first detection of gravitational waves [reported by Advanced LIGO last month] was from the merger of a pair of 30-solar-mass black holes. They probably came from 100-solar-mass stars."